J. Rockett WTF Fuzz Review – Best Overdrive/Fuzz Pedal? The J. Rockett WTF Fuzz is a fuzz pedal for people who don’t like fuzz. This is one of those very special fuzz pedals that offers something a little different from the norm. The WTF Fuzz can produce mild overdrive sounds all the way up to intense sub-oscillating fuzz effects. It’s supposedly even capable of achieving hornlike sounds similar to a trumpet or trombone. The WTF Fuzz is a collaboration between J. Rockett Audio Designs and Paul Trombetta and is based on Paul Trombetta Designs’ Minibone fuzz pedal. The WTF Fuzz benefits from an added Boost switch with separate volume level control, a 3-way switch for EQ adjustments and an 11-position rotary knob for selecting the amount of oscillation. There’s also a promise of exceptional volume clean-up and dynamic control from your guitar. Is this the best overdrive/fuzz pedal? You’ll find out in our J. Rockett WTF Fuzz review. Gain control knob adjusts overall distortion level. Highly interactive with the WTF control. WTF control knob adjusts the oscillation of the pedal. 11 different positions can be selected. Works in conjunction with Gain control. Boost control knob is a second volume control that provides a variable amount of volume boost or cut. 3-position EQ switch selects between neutral (left), bright, (middle), and dark (right) EQ settings. Useful for helping pair the WTF Fuzz with your guitar and amp. Boost footswitch selects between the Boost and Volume controls A/B style for output level control. Useful for selecting between rhythm and lead fuzz tones. 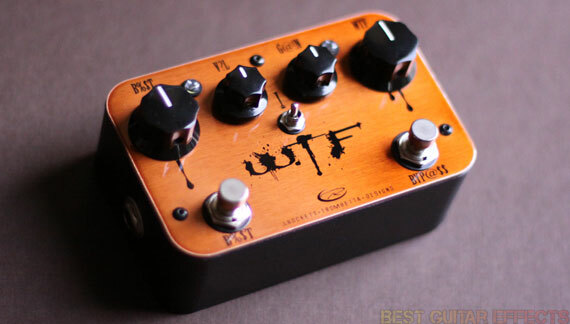 Visit J. Rockett Audio Designs for more info about the WTF Fuzz. 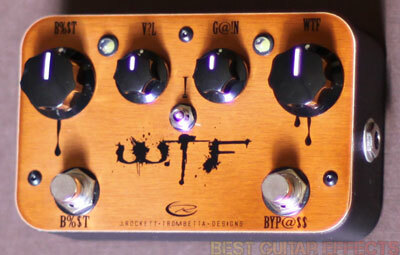 The WTF Fuzz is another one of those guitar pedals I found myself spending plenty of time with to really appreciate what it has to offer. There are some fuzzes out there that can produce some unique oscillating fuzz tones, but they’re often quite hard to dial in. The WTF Fuzz benefits from having a very simple control layout that makes finding traditional to extreme fuzz sounds easy. Starting with the Gain rolled at around 8 o’clock and the WTF control on the 1st setting, the WTF Fuzz produces some very musical overdrive sounds. The 3-way switch lets you roll off some high-end if your amp is too bright or if you need to tame some single-coil pickup harshness. I generally prefer the middle setting but may occasionally flip the switch to the left with brighter sounding pickups. The WTF Fuzz plays exceptionally well from the guitar, cleaning up beautifully when you roll back your guitar’s volume knob. If you leave the pedal at the brightest EQ setting, you can attenuate the high-end with your guitar’s tone knob. The WTF Fuzz can be considered a real player’s pedal in regards to the quality of its sounds and how it interacts with your instrument. Seasoned guitarists will certainly appreciate how responsive this pedal is. What’s really interesting about this pedal is how every knob of the pedal helps to fatten the sound with more saturation. With a low Gain setting, a boost of Volume will thicken up the sound in a very nice way. Also, a boost of the WTF control to a setting around noon or beyond adds considerable girth to your tone. Even at higher WTF settings, the pedal produces some very good distorted grit that stays within controllable confines. With a slight twist of your guitar’s volume knob, you can easily switch from overdrive to fuzz tones. Pushing up the Gain and adjusting the WTF knob is where things start to get really interesting. When you crank the WTF to the higher settings and increase the distortion, the pedal will start producing some droning oscillated notes. The droning notes my pedal produced were surprisingly in tune, and I can’t help but wonder if Paul Trombetta and J. Rockett purposefully tuned the WTF knob settings for that reason. Of course, if you don’t want uncontrollable oscillating drones to erupt from the pedal between notes, just back off the Gain slightly until the droning stops. 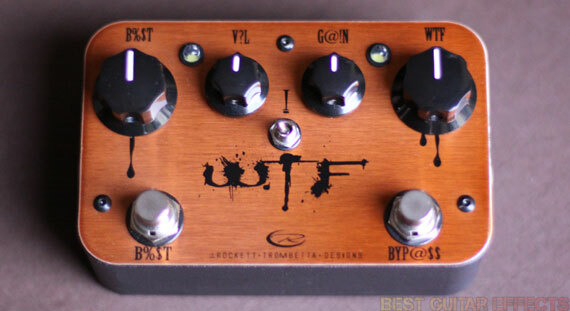 With a judicious amount of Gain pulled back just enough to reign in the oscillation and the WTF knob rolled to the right of noon, the WTF Fuzz will treat you to huge fuzz sounds that are just on the brink of chaos. This pedal is absolutely packed with usable tones, and even the most intense sounds are more musical than a lot of fuzz pedals out there. I especially like how even on extreme settings that decimate the chords you play, a slight cut of your guitar’s volume tames the intensity of the pedal and cleans it all up. It can’t be stated enough just how musical the WTF Fuzz is at nearly every setting. This is one of the most surprising pedals I’ve played in a while. I like the WTF Fuzz more and more every time I play it, and I’m sure you will, too. Let’s see the final result. The J. Rockett WTF Fuzz is most of the most versatile and musical fuzz pedals available. The claim of being “a fuzz pedal for those who don’t like fuzz” holds up well, as the WTF Fuzz makes for a killer overdrive. Keep the Gain low and adjust the WTF to taste for some mean overdrive tones. Using the Boost gives you 2 distinct volume levels to set it in the mix, and the pedal cleans up amazingly well with a slight cut of your guitar’s volume knob. It’ll do all manner of thick fuzzy distortion tones and oscillating drones if you can handle them. Looking for the best overdrive/fuzz pedal around? Spend some time with the J. Rockett WTF Fuzz. That concludes our J. Rockett WTF Fuzz review. Thanks for reading. Want to buy the J. Rockett WTF Fuzz?